The digital age has changed how we work. Today, people from different parts of the world can work on the same project without ever meeting each other. Still, insufficient communication can harm team efforts and make collaboration inefficient. Poor communication causes teams to become less motivated and productive. Solving the problem of communication is extremely important for all businesses, from relatively small companies to large multi-billion-dollar corporations. The founder of betwixt.us approached RubyGarage with a fantastic solution to this problem – zanie, a chatbot to help companies build strong and productive teams. Delivering a viable product that fully realized zanie’s goals was a challenge for our team. To develop a successful digital product, you need to ensure that software is not only useful for businesses but convenient for users. We put ourselves in the shoes of businesses to define the right functionality and put ourselves in the shoes of users to make zanie intuitive. In-depth research, a lot of brainstorming, and hours of discussions with our client gave us a complete understanding of what functionality this Slack chatbot should have and how we should build it. That’s how zanie passed from a concept to a blueprint for further development. Zanie is a virtual host or, in other words, a chatbot whose task is to build bridges between people by promoting communication and helping teams be more efficient. Zanie was conceived as a chatbot that would integrate with one of popular communication tools used by businesses, so that team members could engage in informal conversations right in the messaging platform they already use. Zanie is based on a solid scientific background, as the team behind zanie developed a unique 4-D framework based on principles from psychology, sociology, human behavior, and philosophy (which we’ll talk about later). Zanie is a powerful tool for businesses that helps them boost productivity and effectiveness. It’s a cloud-based team building solution that encourages interesting and meaningful conversations that build trust and ultimately make teams more productive. As you can see, zanie offers a concrete benefit – higher productivity. Zanie is a helpful tool not only for distributed teams but for co-located teams as well; this chatbot helps build stronger teams within any company. Moreover, zanie is a powerful tool for HR departments, letting them receive feedback from employees. How Does Zanie Work for Businesses? Using a chatbot for team building sounds great, but you’re likely wondering how it works. Before explaining how our team developed zanie, you need to have a clear understanding of how exactly businesses use this chatbot. First, you need to add zanie to your existing Slack team. Next, zanie will let you create groups, assign administrators, and manage team members. Of course, you can create groups based on your company’s own preferences (for example, by department, by location, or randomly). Onboarding round. The questions in this first round are useful for HR departments as they help them learn more about each team. The onboarding round helps companies find out how people interact within their teams. These questions can be tailored to the needs of your company. Lightning round. When the onboarding round is over, zanie moves to the lightning round that includes simple and entertaining questions. The purpose of this round is to get users interested in conversations with the Zanie bot. When the two polling rounds are over, zanie starts asking questions to trigger discussion. 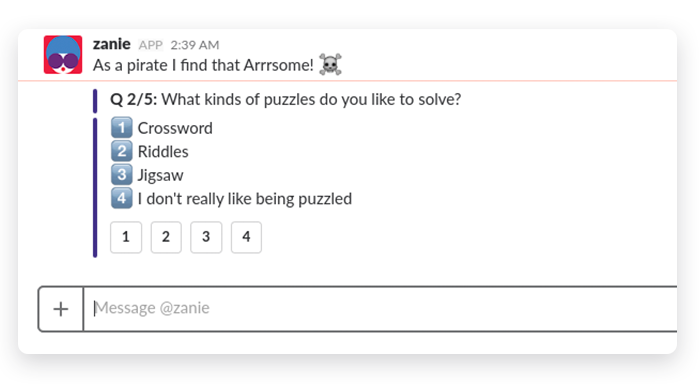 The chatbot creates a new Slack discussion channel and adds people who have answered zanie's questions. Team members can see each other’s responses and thus have something to discuss. All of zanie’s conversation starters are designed according to the 4-D framework developed in collaboration with the Institute of Cognitive and Brain Sciences at UC Berkeley. This framework is designed to bring people together despite their location, culture, and so on. The framework is based largely on Social Penetration Theory, which states that interpersonal communication gradually progresses from shallow to more intimate levels. The 4-D framework involves incremental and frequent interactions, so zanie asks a new question at a specified interval (daily, weekly, etc.). When the chatbot asks a new question, it archives the previous discussion channel and creates a new one. Businesses must be sure that zanie works well, which means they need to monitor the performance of their teams. Zanie has an intuitive dashboard that displays important analytical information about the chatbot (number of groups, activity in each group, etc.). Zanie’s analytics are based on machine learning algorithms that collect, process, and analyze all information generated by zanie. Thanks to machine learning, zanie is really smart. For example, the chatbot keeps track of the skip rate and doesn't ask questions about topics that most users don't answer. Moreover, zanie matches user responses and clusters people according to interests. This project was really exciting for RubyGarage, as it required non-standard approaches and out-of-the-box thinking. As soon as we defined the main challenges, we got down to turning the idea into a fully functional digital product. Zanie isn’t a typical web or mobile application like our team usually develops, but rather a chatbot integrated into a messaging platform. Building a fully functional chatbot was a real challenge, so our team carried out a lot of research to find solutions. Slack. Launched in 2014, Slack quickly became the fastest-growing app in history. As of November 2017, Slack was used by over 50,000 paying companies and boasted 9 million weekly active users. Slack provides direct and group messaging, video and voice calls, smart notifications, lots of integrations with third-party solutions, and more. Microsoft Teams. Microsoft’s hub for teamwork supports chats, calls, meetings, integrated Office 365 apps, and other functionalities for team collaboration. Stride. 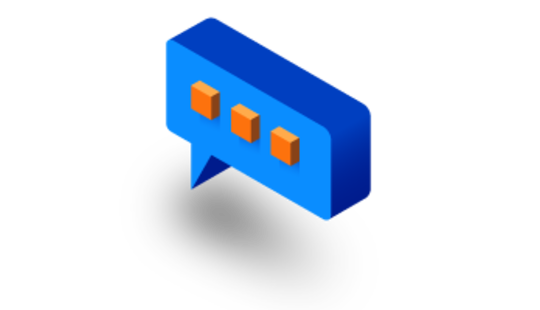 In September 2017, Atlassian’s previous team collaboration platform, HipChat, was replaced with a new tool called Stride. Stride’s functionality includes direct messaging, group chats, video and voice conferencing, meetings, and more. When our team started working on zanie, Stride hadn’t been released. 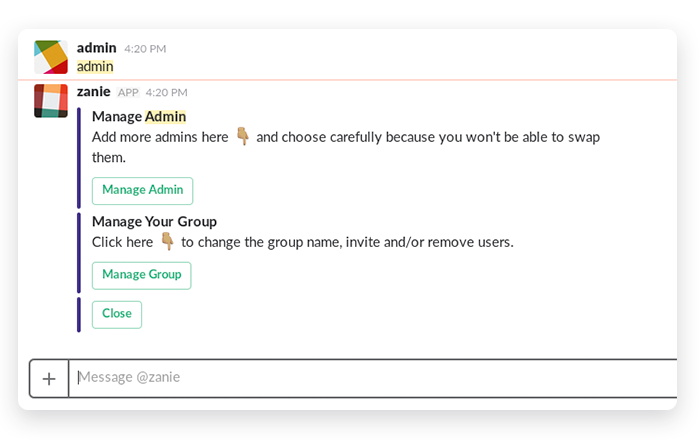 Our team selected Slack as the first platform to build zanie on with the goal of creating a similar bot for other platforms later on. We chose Slack because, first of all, it’s used by businesses of all sizes – from small companies to large corporations. Second, the Slack API allows developers to easily integrate apps with Slack. Slack Web API for using certain methods via HTTP requests. Events API for tracking a variety of events through incoming web hooks. Real Time Messaging API for exchanging messages via web sockets. Using these three Slack APIs allowed our team to build a fully functional chatbot. To ensure the scalability and updatability of zanie, we decided to go for a microservice architecture. This means that the Slack bot comprises separate microservices that work together. In the microservice architecture, each microservice is in charge of just one functionality and has its own database. Independent deployment. Each component of a microservices-based application can be deployed independently. This makes updating components fast and easy. Scaled development. The microservice architecture speeds up development, as team members are responsible for rolling out just one particular service. Flexible technology stack. Each service can be developed with different technologies. This allows developers to use the most appropriate technologies for each service. Improved uptime. Faults usually affect only one component, while other services keep functioning. Now that you know what the microservice architecture is and what benefits it provides, let’s talk about what components (i.e. services) zanie consists of. Chatbot application. This application contains the code responsible for the chatbot’s behavior. It connects to the Slack Real Time Messaging API and Events API to receive events such as channel creation or archiving. Zanie communicates with people using responses from the Slack Real Time Messaging API and zanie’s own API. Zanie RESTful API. This is the main interface for storing and processing data for the chatbot and dashboard. Client dashboard. The dashboard is a single-page application that allows users to manage their accounts and view real-time analytics. Betwixt analytics. To reduce load on the zanie RESTful API, our team built this application specifically to listen to all events in the chatbot and send them to Segment (which is used for pushing data to powerful marketing tools providing deep analytics, such as Mixpanel). Administration platform. This application allows the founder to manage zanie as well as to monitor its performance (through the administrator dashboard). The platform contains a database of questions, stores all user responses, shows statistics (such as a total number of teams and groups), and more. Our team used Active Admin to build this app. Our team had to develop a chatbot application that would work perfectly with an increasing number of users. Therefore, scalability was our priority, and we used a service-oriented architecture to achieve it. We used Amazon EC2 for secure, reliable, and highly scalable cloud-based hosting. To maximize the efficiency of our Amazon Web Services configuration, our team included Elastic Load Balancing and Auto Scaling, which automatically scale capacity up or down depending on conditions. The Zanie chatbot app is intended to help businesses globally, which means the chatbot requires fast and reliable storage. 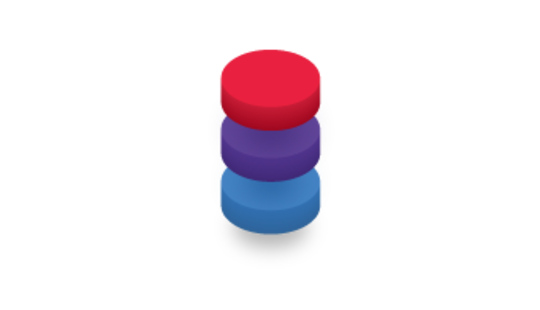 Our team picked Amazon S3 for object storage, Amazon RDS for a relational database, and ElastiCache as an in-memory data store. Our team needed to suggest a viable monetization strategy for zanie. According to zanie’s business logic, the chatbot had to be available in two versions – a free trial and a paid version. Based on this business logic, our team suggested subscription functionality to differentiate free and paid users. This made a payment system necessary to allow users to pay for subscriptions. We selected Stripe, as this payment platform can be used to manage both subscriptions and payments. 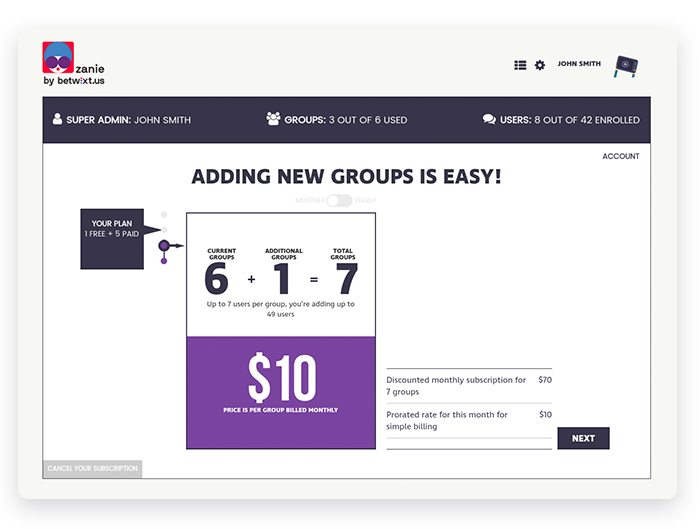 A free trial gives businesses a one-year subscription and allows them to create one group with up to 7 users. If businesses want to keep using zanie after the free one-year subscription expires or if they want to create more than one group, they need to switch to one of the paid versions. 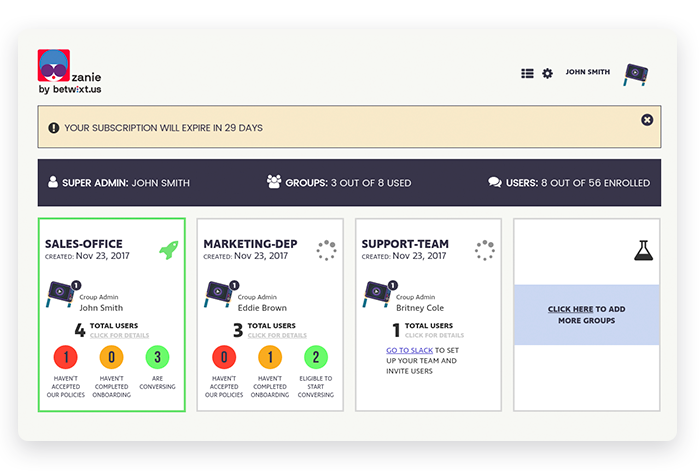 Subscriptions and payments are managed in a client dashboard. In a conventional web or mobile application, designers create a human-centered graphical interface that helps users interact with the app. In other words, they use the power of a graphical user interface. Chatbots are different. 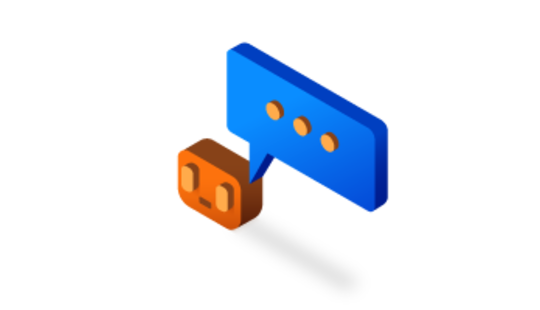 Being integrated into a messaging tool, a chatbot inherits its graphical interface, so the only way it can interact with users is through conversations. Therefore, a chatbot requires a conversational interface that encourages communication and user involvement. To help zanie trigger discussions, our team created an engaging conversation interface. First, the chatbot asks questions in a friendly manner so that people feel comfortable interacting with it. Second, we implemented a button flow for interactions with the chatbot. Initially, we used slash commands to communicate with Zanie, which is the usual method for communicating with bots in Slack. This method, however, turned out to be inefficient, as users were reluctant to answer zanie’s questions by typing slash commands. 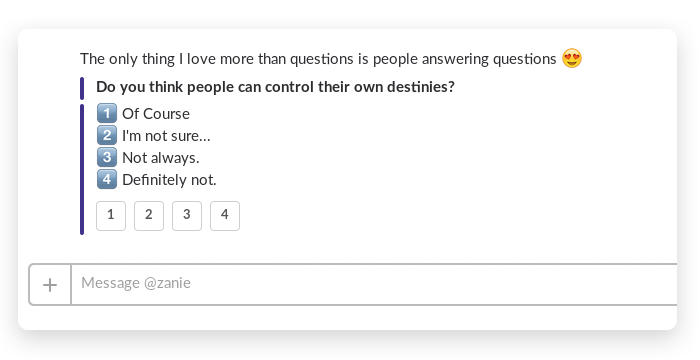 That’s why our team opted for a button flow that lets team members reply to zanie’s questions by clicking buttons. Thanks to the button flow, users can answer questions in a matter of seconds and without any special knowledge (not everyone is familiar with Slack commands). We’ve already drawn your attention to the strong scientific background behind zanie. To be able to improve and upgrade the chatbot, its owners needed to collect and analyze data related to performance and answers to questions. So our team implemented data collection functionality – zanie stores information such as message history, likes, stars, and polling results. All this information allows betwixt.us to monitor zanie’s performance and find out which questions are efficient at triggering conversations among team members and which don’t work. We’ve already mentioned that Zanie uses advanced machine learning algorithms for data analysis. Our team was in charge of preparing data (anonymizing and encrypting it) and implementing algorithms. The algorithms themselves were developed at UC Berkeley. Our team did a great deal of work to deliver a top-notch digital product that connects people across distributed and co-located teams. Zanie helps people get to know each other, establish trust, and work well together. If you want to develop a chatbot for your business, don’t hesitate to drop us a line. Our team will help you get your project up and running.